Kathy hobbled with a contorted grimace of pain five seconds following her practice of the classic tree pose. Pain is an experience we are not seeking in yoga class. Or after practicing any of the poses anywhere. In a women’s yoga and meditation group I guided, my student Kathy experienced the pose with everything but calm and joy. She works out at the gym 4-5 times per week. Kathy is fit and strong. As I was about to check in with her, she staved me off: “I’ll tell you later” she responded. We are often disconnected from the health of our feet, and attempt to “work-out” virtually every part of our body: except our feet. To many of us, our feet may as well be invisible, when in fact we rely on them to transport us through our lives on this planet. Our feet root us to mother earth. They deserve care and attention. When I taught chair yoga in an extended care facility, my physician colleague told me he could assess the general state of a resident’s health by examining their feet. In my classes, I often mention how our feet are the “basement” of our physical body. If the foundation is off kilter, this imbalance will impact the rest of the structure. Our feet have a tale to tell! Kathy soon confided in me that she was recovering from plantar fasciitis, a fact that she did not share on her workshop intake questionnaire. Learn more about preventing and healing plantar fasciitis in this post. Explore “Yoga for the Toes” here. As we spoke further, Kathy disclosed that impact and repetitive motion of running on the treadmill too many days per week was probably the cause, according to her physician. One fun and very effective way to heed the call of discomfort in our feet is through Yoga Tune Up® Therapy Ball exercises. There is nothing like rolling out the soles and toes of our feet in every direction with the Therapy Balls to keep our foundation flexible and supportive. 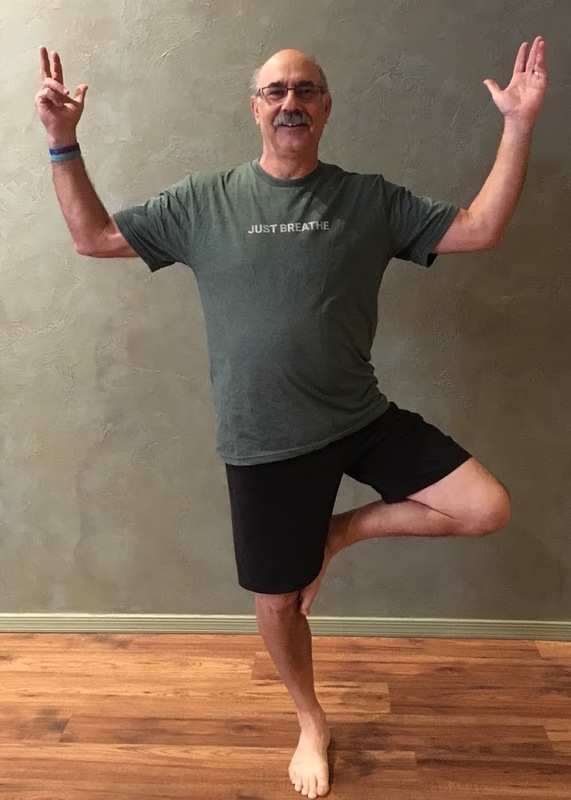 Norm happily balances in tree pose after applying TLC to his feet with our Yoga Tune-Up therapy balls! I offer therapeutic ball work as well as foot/ankle exercises in all of my classes. This work on our foot foundation supports balance, circulation, and overall health. As the only licensed Roll Model Method Practitioner in Pima County , I strongly advocate and integrate creative therapeutic ball work into my classes and workshops. Your next step? Check out our class schedule for a class or workshop near you. Yoga classes make a great gift for yourself and a friend!